The author of On the Origin of Species book changed how man views himself in the universe. Darwin's Galapagos visit laid the groundwork for his theory of evolution. Charles Darwin grows up uneventfully in England in an upper-middle class environment. His father is a well-to-do doctor. He starts off studying medicine, but loses interest. Charles Darwin's focus drifts to natural history and botany, fields that fascinated him during his childhood. In 1831, after graduating from Cambridge University, Darwin signs on the HMS Beagle as the ship's naturalist. The round-the-world voyage lasts nearly five years. In 1835, the Beagle spends five weeks exploring the Galapagos Islands. 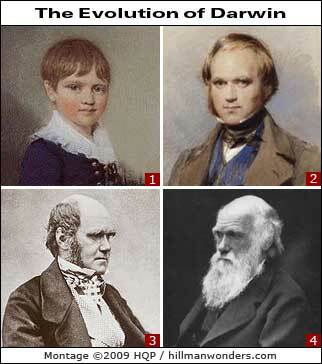 Charles Darwin, then 26, avidly researches and collects biological specimens. It was only after Charles Darwin returned to England that he begins grasping in earnest the concept of evolution theory, with natural selection being the mechanism. Essentially, Darwin believes that organisms that best adapt to an environment are more likely to survive and pass on their genes to future generations. Interestingly, Darwin's book, On the Origin of the Species, isn't published until 1859, more than two decades after he left the Galapagos Islands. The book creates widespread controversy, from the public and especially from the church. As time passes, his theory of evolution becomes widely accepted by the scientific community and public at large. By the time he dies in 1882, he is a legend among his peers and famous around the world.